The Fuso Canter E-Cell is now the Fuso eCanter. The new name represents the third generation of the world's first fully electric-powered light truck, and the small-scale production run is an important step on the way to full production. Technically, the eCanter is radically different from its predecessor and benefits from the extensive findings of customer trials with the second generation and the reduced costs of battery and component technology. The new eCanter uses a permanent synchronous electric motor with an impressive output of 185 kW and torque of 380 Nm. Power is transferred to the rear axle by a standard single-speed transmission. The vehicle premiered at the IAA has a battery capacity of 70 kWh. Depending on the body, load and usage, a range of more than 100 km without stationary recharging is possible. The batteries are spread over five units, one centrally in the frame right behind the cab and two more on each side of the frame. They are water-cooled lithium-ion batteries that provide a long service life, high efficiency, especially at high ambient temperatures, and compact construction of the battery units. The eCanter's exceptional weight balance is worth highlighting. The chassis load capacity of the 7.49 t vehicle is 4.63 t including the body and load. Individual battery packs with three to six sets of batteries of 14 kWh each are planned for the upcoming small-scale production run. This allows the eCanter to be adapted to customer requirements with regards to range, price and weight. The concept is based on the results of customer tests that show that for some operators, payload is more important than range, while others are happy to sacrifice payload for longer range, i.e. more batteries. Equally adaptable are the charging options: up to 80 percent capacity within an hour with direct current at a quick charging station, or 100 percent in seven hours with alternating current. In the future, rapid charging with 170 kW will be possible, meaning 80 percent battery capacity in only half an hour. A standard Combo 2 plug (known as Combined Charging System) is used for charging. 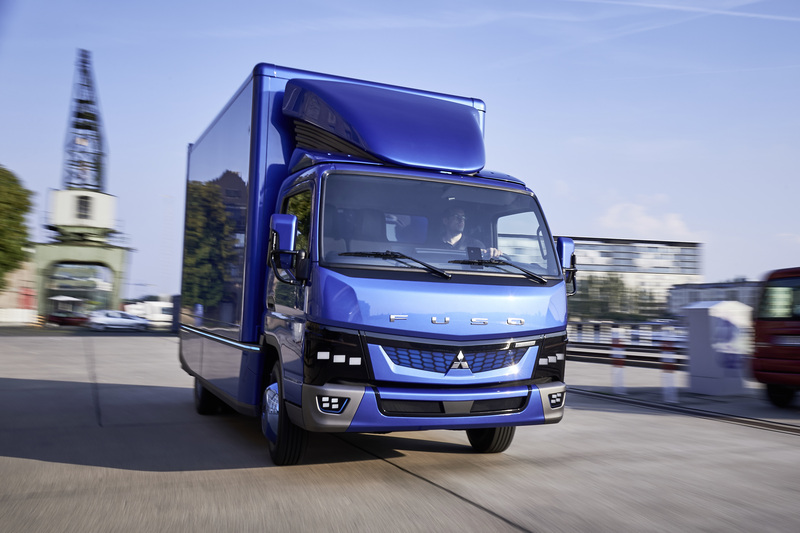 The Fuso eCanter's locally zero-emission drive will not only reduce the impact of exhaust and noise emissions on city centres, but will also be an economically attractive alternative to diesel engines. Thanks to lower technology costs the eCanter will be launched to market at a competitive price. In addition there will be lower running costs compared to an equivalent diesel model. The results of a year-long fleet test with the second generation electric Canter have shown that around 1,000 euros per 10,000 km can be saved with this vehicle compared to a diesel version. Coupled with a reduction in maintenance costs of around 30 percent, this makes the Fuso an economical solution for customers. The projected sales price means that any additional expense will be repaid in less than three years. These vehicles have proven their suitability for daily use in short-radius distribution and urban transport. While the technology is the same as in the small-scale production model, the design elements provide a vision of the eCanter's future. It provides an attractive design, with LED headlamps and a distinct grille and bumper, and a redesigned interior including a central, removable tablet with connectivity functions. The wide comfort cab is painted in metallic blue, as are the fully-clad sides. A walk-on glass floor in the exhibition vehicle's box body offers a view of the drive unit and the batteries.